November is Lung Cancer Awareness Month. I was surprised to learn that lung cancer is the leading cause of cancer deaths in the U.S. Since there are no tests for early detection, we should educate ourselves to know what signs and symptoms to look for. This article covers the basics to shine a spotlight on the symptoms and treatment for lung cancer. First, lung cancer outnumbers deaths from other major cancers (breast, colon, prostrate, ovarian, and lymph) combined. Scary stuff! The prognosis for a diagnosis of lung cancer is poor, because typically it is discovered late. Survival rate is approximately only 13-15 percent after 5 years. Therefore, the need to find clarity on which is the best diagnostic tool is urgent, both to save lives and decrease the burden on the health care system. A few years ago the National Cancer Institute released findings of a large, randomly controlled study of 53,546 people at 33 centers across the U.S. The primary objective was to compare use of the CT scan versus a combination of chest x-ray and sputum cytology (where a sample of mucus is drawn from the lungs). The study showed that the CT scan proved superior to the chest x-ray and sputum method. The CT scan was able to detect tumors earlier, providing a higher survival rate and resulting in fewer deaths from lung cancer. This study is part of an ongoing series focusing on current and past heavy cigarette smokers, as well as non-smokers: 10, 208 participants provided specimens of blood, urine, sputum, and tumor tissue for future research. This research will compare molecular activity between persons with and without lung cancer. The release of this study gives us a chance to review the common complaints leading up to a diagnosis. All of these are respiratory, though about 25% who are diagnosed exhibit no signs and symptoms. Some of this asymptomatic 25% had a previous diagnosis of anotherrespiratory complaint such as asthma. I have seen patients who say their diagnosis came after a month or so of one or two of the symptoms, below. If you or someone you care for has a known risk factor and shows symptoms, see a doctor to rule out the worst. Cigarette smokers, non-smokers (via second-hand smoke), people exposed to environmental toxins in high doses (gas, chemicals, car exhaust, etc. ), and people with lung cancer genes are considered to be the at-risk population. As research emerges we find many more environmental toxins influence cell dynamics that give rise to cell mutations, and ultimately cancer. 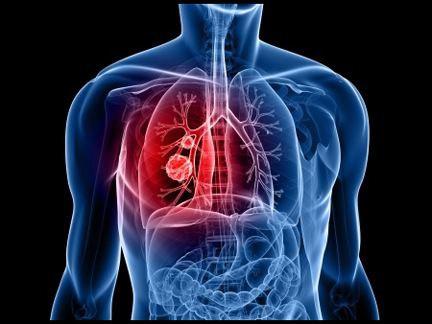 A diagnosis of lung cancer, including patient health history and symptoms, is made with one of the following test methods: chest x-ray with sputum cytology, CT scan, pulmonary function test (PFT), positron emission tomography (or PET scan), and a biopsy of lung tissue. The determination is based on the type of cancer the doctor believes is present. Biomedicine treats lung cancer with three main therapies, depending on stage of disease and type: chemotherapy, radiation, and surgery. Eastern Medicine does not treat lung cancer. But acupuncture can be used to improve the quality of life for the patient by treating lung cancer symptoms, and as an adjunctive therapy to alleviate the common side effects of radiation and chemotherapy, as well as giving a boost to the immune system.